Personal Branding is a hot topic and it should be. It is something we all need to think about. It doesn’t mean that people should feel under pressure to create a brand identity and a website to go with their Personal Brand. But do remember, you have a Personal Brand regardless of what you show visually. However if designing an identity makes you excited and it is something you would like to do, then absolutely go for it and have fun doing so! It will really show the weight you put on your own brand and it will also give people some insight into who you are before they ever meet you. So today I wanted to show you a brand identity we created for one of our fantastic clients – Corporate Executive, Patricia McGovern. I love Patricia’s brand visually, but more importantly I love the values it is anchored in. Patricia is a passionate, hard-working Corporate Development Specialist who lives and breathes her brand. She wanted to portray her personality and skill set in her brand identity and asked us to help her. If you work with Patricia you will experience professionalism, honesty and a detail focused individual that will ask you questions you never even thought of asking. A large of part her success is down to networking, a topic Patricia could write a book about. So when she approached us about designing her Personal Brand, we really wanted to portray all of the above. We created a direct simple logo that has unique elements representing Patricia’s personality. We made sure to get in a number of circles showcasing the importance of networking. We had to cross that beautiful t and dot those important i’s. We designed a unique type that also showed her multi skill set; hence you see lines and lopes, circles, and slants. This identity is simple in black and white but at the same time it says so much. 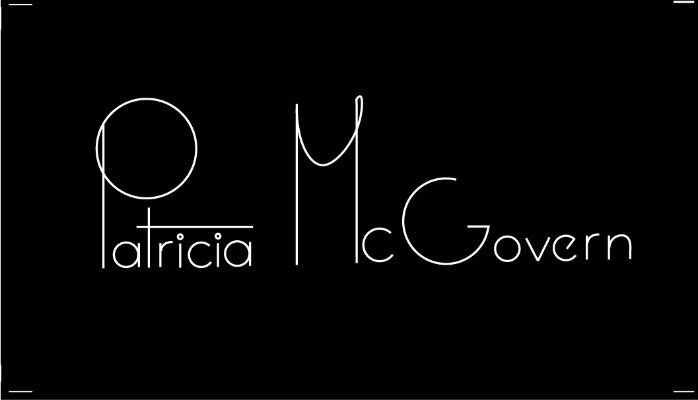 I hope you like it and I cannot wait to hear and see what Patricia McGovern does with her Personal Brand in 2016.